That yellow rectangle is a pineapple stick, FYI. While McDonald’s has been making strides to improve the nutritional merits of its Happy Meals here in America, its locations in the U.K. are a step ahead, at least when it comes to adding veggie-based options to the mix. McDonald’s U.K. last week debuted a new Happy Meal Veggie Wrap comprised of a tortilla-wrapped veggie goujon. Goujon? Goujon. According to its ingredient list, the goujon is a patty made of yellow peas, tomato, breadcrumbs, rice, and herbs, which is wrapped inside a tortilla with shredded lettuce and ketchup. It clocks in at 209 calories. While all the ingredients in the wrap are vegan, McDonald’s notes that the tortilla wraps are toasted in the same ovens as McDonald’s buns, which do contain milk, so the company has avoided referring to them as totally vegan. 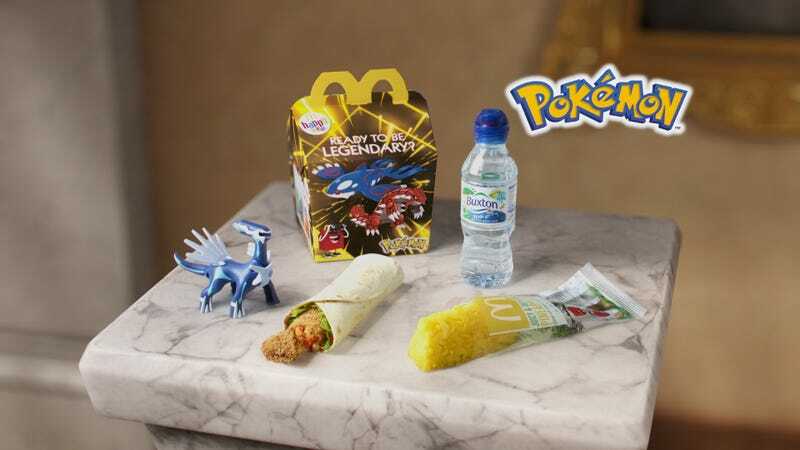 A slightly different, non-Happy Meal version of the wrap, called The Spicy Veggie One, also hit regular McDonald’s menus in the U.K. This wrap is like the Happy Meal version but with the addition of spicy relish and red onions. In a press release announcing the new wraps, McDonald’s U.K. says a third of McDonald’s customers say they think it’s important to include more meat-free meals into their diets, which prompted the chain to work with the U.K.-based Vegetarian Society to develop the new menu choices. No word on whether the goujon wrap will cross the pond to American menus, but if it did, we’d really urge McD’s to reconsider that item name. Ask The Salty Waitress: How should I tip at an open bar?